Thanks to @scythevettore on twitter for the colorful calendar view of March with the Phillies Grapefruit League schedule. It's the Yankees today on March 1st and them the resurgent Blue Jays (who bought most of the Marlins team in the off season) and then it's on to a lot more games on the March slate. Yes, there is plenty of time to get down to Florida to see this team in Spring Training mode, if you're still on the fence about going. But, rest assured in only a month or so from now, you'll be able to go down to Citizens Bank Park and watch some baseball. 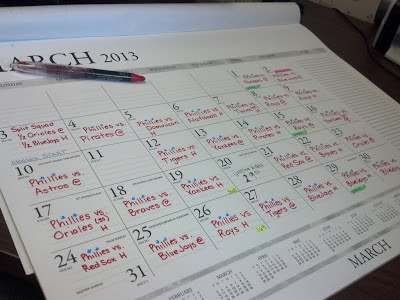 For now though, it's March Madness and the March Phillies schedule and don't forget about the wearing of the Green on St. Patrick's Day - a day when everyone is a little Irish. It's going to be a great month!